I colour animals because they have always been important to me. 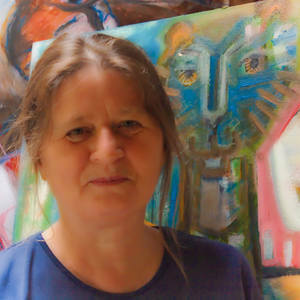 The painter and gallery holder John Lyons wrote about my work: Colleen..., oddments intuitive in composition and colour. Hello, I am a painter, printmaker and teacher. Her paintings are visual visions with an innocent sense of awe. She expresses in her work an affinity to animals in a way that invites the fabrication of mythological stories with hints of the archetypes. I am influenced by the work of Franz Marc, Ken Kiff, Albert Herbert and the Dorset printmakers. My paintings are less nature, animals and people.